The house is fitted out with everything you should need for your stay. Towels and bedding are included and in the winter the house is very snug with oil-fired central heating. Shower gel, Shampoo and toothpaste are also included. As is Tea and Coffee. A cot is available as well as a buggy and potty! We've made every effort to make sure the house is safe for children of all ages. However, we can't take responsibility for any accidents and parents should identify any potential risks to their children when they arrive at the house. 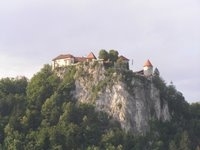 Slovenia, a member of the EU, switched to the Euro in January 2007 and it is accepted everywhere. Please note some small village restaurants do not take credit / debit cards. Getting to the house from the airport is very easy by car. If you wish to use public transport enquire at the airport for the next available bus to Kranj. You can then get a connecting bus to Mojstrana. if you wish, we can organise a taxi. The cost will be approximately €60 each way. When you book we will send you an information pack with everything that you need to know. A code for a key safe will also be sent to you along with the telephone number of our representative who can be on site very quickly in the unlikely event that you experience problems. Our representative can also help you with things like booking activities and hiring ski equipment, ski lessons or guides for climbing.